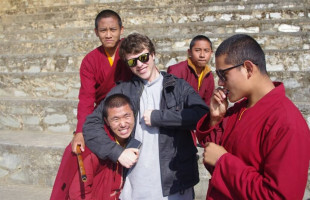 Why Teach English in Nepal at a Buddhist Monastery? With all our exciting, celebrity-packed events, Life of Riley has a reputation for being exclusive and aspirational but have you ever wished for… something less out of life than partying and sports cars? Well, with this chance to Teach English in Nepal at a Buddhist Monastery, now you can! When we say less, we mean more… much more because during your five to twelve-week journey teaching monks in Nepal you’re sure to learn (and unlearn!) just as much about yourself, reality, Buddhism and the path to enlightenment as you teach. It’s no exaggeration to say that you’ll be travelling in The Buddha’s footsteps. Siddhartha was a prince who lived an incredibly sheltered life until he ventured outside of his palace and saw how others lived. Just like how you’re about to step out of your comfort zone and into a new world of helping others under a multitude of fluttering prayer flags! We promise you’ll be a brand new you when you return from this volunteering trip so be warned: You’ll need to be physically fit to live in the Himalayas. You’ll need some jabs and you will live a simple life, sharing a room in the monastery and eating dhal soup, rice and vegetables three times a day! Even though The Buddha said “Life is Suffering” if you’re still up for becoming the new, improved you, you’ll find there’s actually plenty of fun to be had. You can visit the picturesque lakeside town of Pokhara with its bars, nightlife and music scene. trek under Mount Everest in the magnificent Anna Purna mountain range, go rafting or see tigers and rhinos at the Royal Chitwan National Park. Make new friends and try out fun activities without wifi!